#3 buckshot features around 20 pellets in the average shot shell, and offers an effective range of over 30 yards (if shells are patterned and the choke is adjusted accordingly). Sold mainly as ammunition for deer, #3 buck ammo also has a great reputation for large game birds, predators, and home defense. The #3 buckshot size gives you a nice balance if you find the #2 buck too big or prefer more range and punch than #4 buck. Its three-inch shell offers around 24 pellets, depending on the manufacturer. And the type of shotgun you’re using can really influence its performance, which is why patterning is important. Generally, this is considered 20 gauge buckshot, as it's the most popular firearm to use with this size round. Shotgun hunting has a long history across the world, and offers several advantages for hunting in the right conditions. Primarily, the shotgun is a more versatile option for heavily wooded areas where a rifle may have issues penetrating thick brush due to deflection. While a slug can be used for hunting in brush, many opt instead for the #3 buck. This size is also popular among goose hunters, but only in areas where lead shot is still allowed. If not, just switch to the #3 steel shot or a plated buckshot. Depending on where you live and the average size of what you’re hunting, #3 buck can be effective on its own or with the assistance of a good dog or two. The #3 buckshot offers great range combined with an excellent spread at long range. A popular use of this shot is predator control – many coyotes have fallen to this powerful load. #3 buckshot is a little large for critters like rabbits and gophers, which are better taken care of with birdshot or a rifle, especially if they can see you coming. For home defense, the #3 buckshot works with plenty of power, penetration and enough pellets to make an impact on an intruder inside your home or approaching at a distance. Any of the buckshots are good for home defense, but the larger the pellet, the higher the risk of punching through a wall (or two), causing injuries or damaging property. The #3 is a good middle-of-the-road pellet size with a variety of length shells. 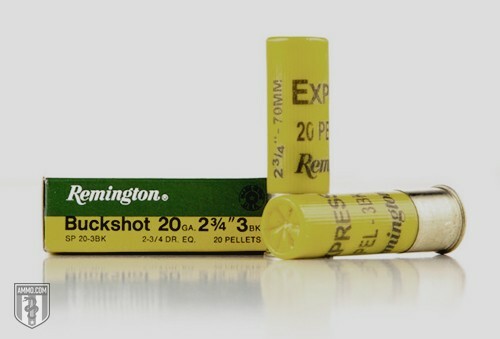 Overall, the #3 buckshot is extremely versatile for any kind of shotgun application, especially using a 20 ga. Just make sure lead is allowed where you plan to go hunting or shooting. And if not, simply pick up the #3 steel shot instead (it’s the same size, though you’ll lose a bit of penetration at longer ranges).